There is always a need for affordable, cutting-edge products for evolving health-care applications, and door and frame products are often part of a complete health-care solution. Manufacturers, more and more, are anticipating the ever-changing challenges of increased security, patient and staff privacy, and microbial contamination. Additionally, the containment of radio wave and radiation interference in hospitals and clinics for X-ray rooms, PET scan theatres, or modern cyberknife clinics is essential. The use of high-security wood doors for patient rooms in behavioral health facilities provides a warm feel while maintaining a safe environment for patients. Acoustic doors: Acoustic steel doors and frames are available that combine outstanding sound transmission loss with the appearance of standard hollow metal products. Such doors can be provided complete with acoustic steel frames, perimeter, and bottom seals. Acoustic wood doors and steel frames set the global standard for sound transmission loss. It is recommended that doors and frames be tested as a unit and supplied with acoustic perimeter and bottom seals. Wood doors are available in virtually any veneer species and cut to match other standard wood doors on a project. Custom stain or clear coat finishes are also available to match the appearance of commodity wood doors. Radio frequency steel doors and frames: These door and frame assemblies should meet combined radio frequency standards. Assemblies shall be provided complete with perimeter gasketing, which is essential to product performance in the field. Materials can include mild steel or stainless steel formats to meet a wide variety of applications. Bullet-resistant doors: Some manufacturers offer bullet-resistant steel doors and frames that are secure from ballistic attack yet have the appearance of standard hollow metal products. Many bullet-resistant products on the market can be furnished with factory-installed bullet-resistant glazing. Another option is bullet-resistant wood doors and steel frames, which can combine ballistic security with the appearance of standard wood door and steel frame products. Wood doors are available in virtually any veneer species and cut to match other standard wood doors on a project. Custom stain or clear coat finishes are also available to match the appearance of commodity wood doors. These products also can be furnished with factory-installed bullet-resistant glazing. Lead-lined steel doors and frames: These are useful when there is a need to combine protection against radiation with the appearance of standard hollow metal products. Manufacturers offer fire-rated and non-fire-rated products. Materials here also can include mild steel or stainless steel, depending on the application. Stainless steel doors and frames: These are used in health-care facilities where there is a demand for an extremely high level of cleanliness. Frames are readily available for use in ICU and operating room environments. Frames and doors can be custom designed and produced in alloys 304 and 316 with a wide range of finishes available. 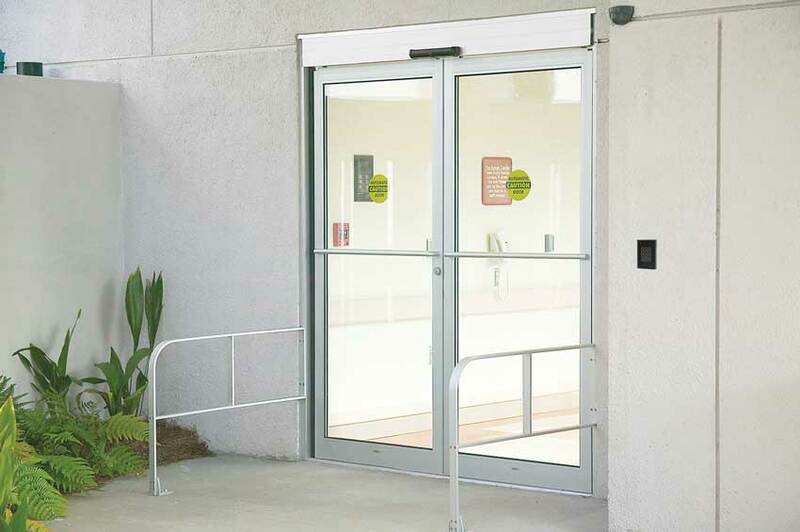 Security wood doors and steel frames: These openings offer state-of-the-art security where patient or personnel security is a key concern. 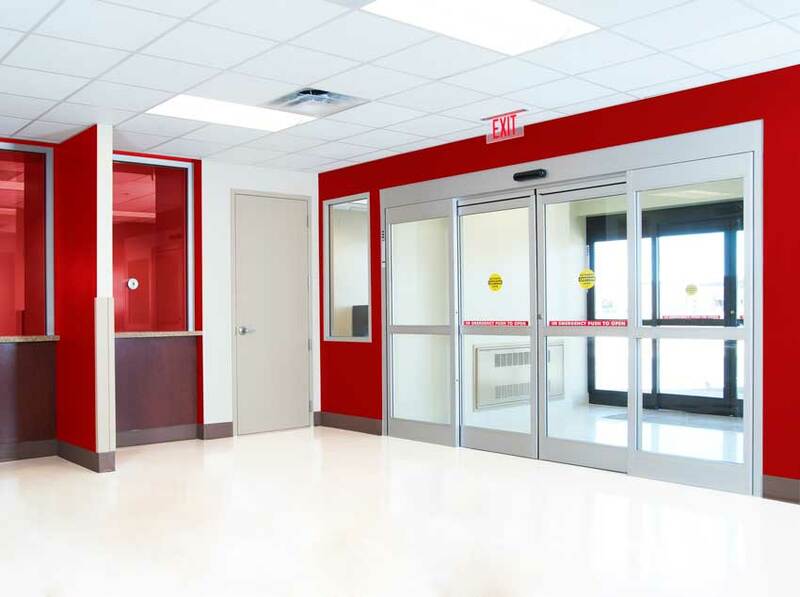 Offering a warm feel and a secure and safe environment for patient rooms in behavioral health facilities, these security openings include anti-ligature and anti-barricade hardware, providing safety and emergency access to patients at all times. Wood bullet-resistant doors in steel were used in the emergency areas of the 72-bed Major Hospital, a general medical and surgical hospital located in Shelbyville, Indiana. Access control for architectural openings is another important management tool providing safety and security in health-care environments. In fact, electronic access control hardware and software can be an important touchpoint in the design of health-care facilities, in conjunction with openings with automatic sliding doors (including all-glass sliding doors and operators). Some product types that are being used currently include exit devices, door closers, cylindrical locksets, and electromagnets for hold-open systems. As health-care facilities are complex and evolving environments, a well-considered access control strategy can be an enhancement, not an obstacle, to effective building performance in terms of ADA, fire codes, and occupant security. Furthermore, product and system specifications are integral to the definition of spatial boundaries and controlled movement through the entirety of a building. Effective application can correct issues in the present and provide adaptability in the future. The bottom line is that for health-care facilities, the complex concepts of health, safety, and welfare are inextricably intertwined. Every health-care-related facility has a responsibility to provide a sterile, physically safe, and secure yet accessible managed environment in order to effectively conduct its daily operations. 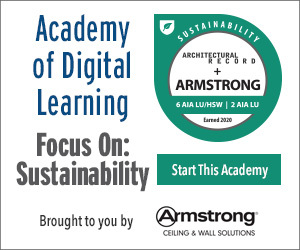 For a successful project, it is imperative that the architect or designer become familiar with the latest products, standards, guidelines (including ADA), codes, and technologies specifically impacting the design and management of health-care facilities. Managing access and security and maintaining a sterile patient environment should always be top of mind in any health-care project. Access control strategies are vital to providing safety and security for health-care facilities. Barrier-free access and access-control solutions helped create an accessible floorplan in an attractive and comfortable setting at Little Colorado Medical Center (LCMC) in Winslow, Arizona. Since 1954, the Little Colorado Medical Center (LCMC) in northeast Arizona has provided vital medical services to a rural population residing more than 50 miles from Flagstaff, the nearest major medical center. With the goal of improving care for patients who travel great distances for emergency treatment, LCMC recently expanded and upgraded its facilities. The 25-bed critical access hospital now accommodates five trauma rooms, five emergency rooms, a nurses’ station, redesigned waiting room, psychiatric room, and a rooftop heliport. Barrier-free access and access control solutions were needed in order to meet the requirements of a highly accessible floorplan with convenient and easy-to-navigate doorways in an attractive and comfortable setting. For the main entrance, LCMC required reliable barrier-free access to allow for fast-moving traffic. Two banks of automatic sliding doors were installed to enable the quick and easy traffic flow so essential during emergency situations. Once inside, unimpeded patient care relied on the same level of barrier-free access between adjacent rooms, provided by a low-energy operator that powers a swing door leading from the lobby area to the inner treatment rooms. Once treated, patients who are not immediately released are cared for in one of seven intensive care cubicles, which needed to be visible and easily accessible from a central nursing station. The solution was to equip each cubicle with a manual sliding door that enables continuous observation of patients, while allowing quick and easy access during emergency situations.